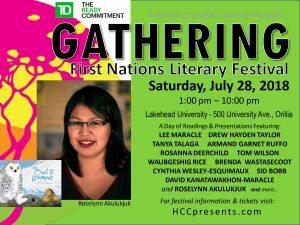 Roselynn Akulukjuk, author of The Owl and the Lemming, will be at Gathering: First Nations Literary Festival on Saturday, July 28. Gathering is a day of readings and presentations. It will be located at Lakehead University in Orillia. For more festival information and tickets click here.